Kenn Blanchard is a former marine who loves riding motorcycles, hunting, fishing and appreciating the great outdoors. Kenn loves guns and has been in almost every job that you can think of that requires a firearm. 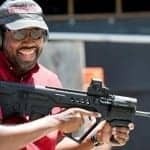 Blanchard first began sharing his love of the outdoors and firearms with others through his popular podcast “Black Man with a Gun,” which has been downloaded over 1.3 million times.